Type of Long Term Care: These policies are fully equipped to cover both the home health care and nursing home aspects of long term care. Coverage Amount: Our policies offer a range of benefits starting a $50 a day for one (1) year up to $250 a day for life. We will help you decide if the extra benefit of this coverage is worth the extra cost based on your individual need. Inflation Protection: You may need this protection if you purchase your policy at a young age. We also offer a program that offers a return of the premium that you've paid! I WANT to avoid dependence. I DON'T want to be a burden to my family. I WANT to avoid welfare. I DON'T want to leave a "bunch of debt". I WANT to preserve assets for my family. Over 60% of all Americans will need Long-Term Care of some kind. For a couple turning 65, the chance is 75% that one of them will need Long-Term Care. The cost of a Long-Term Care illness or injury is $41,000 - $73,000/year. 50% of all couples become impoverished within 6 months of going into a home. 70% of all single people admitted to a home go broke in 3 months. Medicare, Medicare supplements, HMO'S and private health insurance will NOT pay for Long-Term Care. Medicaid WILL pay...but to qualify you must spend down assets & income. In turn, you become poor and/or impoverished. Insurance services to help protect you, your savings, and estate. 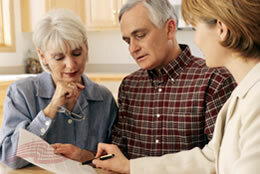 We can offer you the best plan for Long-Term Care, nursing home, and home health care coverages. "Why would I want to buy a Medicare supplement?" You may want to buy a Medicare supplement, because Medicare does not pay for all of your health care. There are "gaps" or costs to you under regular Medicare coverage. A Medicare supplement may help lower your out-of-pocket costs and get more health insurance coverage. To purchase a Medicare supplement, you generally must have Medicare Part A and Part B.
MEDICARE PART A (Hospital Insurance) helps pay for inpatient hospital care, skilled nursing facility care, hospice care, and some home health care. Most people do not have to pay for Part A.
MEDICARE PART B (Medical Insurance) helps pay for doctors' services, outpatient hospital care, and some other medical services that Medicare Part A does not cover (like some health care). Medicare Part B helps pay for these covered services and supplies when they are medically necessary. Most people pay monthly for Part B.